Notre Dame Students are to "Dress for Success." A student's attire reflects upon the student and our school. Students should take pride in their appearance. Compliance with the dress code is the responsibility of the student and his/her parent. All clothing must be clean, press, and modestly styled, in good condition and properly fitted. The uniform is to be worn every day unless an individual or the entire student body has been excused from the dress code. In addition, the uniform must be worn whenever the student is on school grounds and/or representing Notre Dame at an officially approved event. Must be purchased from Flynn & O'Hara. The waistline will be located above the hip and not rolled. Pantyhose or knee socks must be worn with the skorts. Skorts, shorts, and slacks must be modestly fitted. A leather belt, either brown or black in color, must be worn at all times. The belt buckle must be standard in size (not to exceed 1 1/2" x 2", no ornate designs, studs, sequins, camouflage patterns) and be situated on the centerline of the torso. Uniform shorts purchased from Flynn & O'Hara may be worn from September 1st to October 31st and May 1st to June. Pant legs may not be rolled and must be hemmed. Must be navy blue or khaki in color. The practice of affixing a Flynn & O'Hara manufacturing tag on a non-Flynn & O'Hara garment is prohibited. Long or short sleeves, loose fitted dress blouse, clean and pressed. The blouse may be white or light blue but must be oxford style and cloth (button down collar and button placket). Only the top button may be undone. The blouse is to be tucked in at all times and long enough to stay in while seated. Uniform polo shirts purchased from Flynn & O'Hara may be worn from September 1st to October 31st and from May 1st to June. Polo shirts must be tucked in at all times, may not be torn or cut, must be clean, pressed, generously fitted, with no undergarments visible. T-shirts or undergarments worn underneath oxford/polo shirts must be plain white. The Notre Dame uniform sweater purchased from Flynn & O'Hara may be worn at any time. The incorporation of "thumb holes" is not permitted. Sweaters must be generously fitted, clean, and neat. Sweaters are not to be written on or have drawn designs. Shoes, including the sole, must be solid brown or black and must be worn throughout the school year. Shoes may not have logos. Socks and/or stockings must be worn at all times. Sneakers are not permitted outside of physical education class unless accompanied by a medical excuse. Sandals, Uggs, cloth/canvas/net shoes, moccasins, "skateboard" shoes, high-tops, slippers, boots, boat/deck shoes, and clogs are not permitted. Hair must be the natural color. It must be neatly shaped, clean and acceptably styled. Multiple hair colors will not be permitted. Faddish hairstyles (Mohawk, ornate design ut into eyebrows or scalp area) are not to be permitted. Headbands may be worn if they are narrow and used only for the purpose of holding hair back from the face. Headbands extending below the collar are prohibited. Hats, bandanas, and scarves may not be worn inside the school building. This includes "dress down" days. Earlobe plugs are not permitted. Earrings are to be worn in the ears only. Visible body markings and tattoos are not permitted or will be covered from view at all times with a long-sleeved shirt or trousers. Gauze pads and/or bandages are not a substitute for this requirement. Chains attached to wallets or keys are not permitted. Spandex (or similarly clinging material) workout/dance attire is not permitted (this includes "dress down" days). Sleeveless shirts or blouses are not permitted. 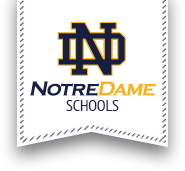 Only approved Notre Dam T-shirts, shorts, and sweatshirts and pants are authorized for wear in Physical Education classes only. Pants must be properly fitted, with the belt line located above the hip. A leather belt, either brown or black in color, must be worn at all times. The belt buckle must be standard in size (not to exceed 1 1/2" x 2", no ornate designs, studs, sequins, camouflage patterns). The buckle must be situated on the centerline of the torso. Long or short sleeves, loose fitted, clean and pressed. Shirt sleeves will not be rolled up or cuffed. Must be worn with a Notre Dame tie. Ties are purchased from Flynn & O'Hara. The tie must be properly tied and drawn firmly to the neck. bow or bolo ties are not permitted. The shirt may be white or light blue, but must be oxford style and cloth (button down collar and button placket). Shirts may be purchased at any store or from Flynn & O'Hara. All buttons (including the collar) are to be buttoned. The shirt is to be tucked in at all times and long enough to stay in while seated. Uniform polo shirts purchased from Flynn & O'Hara may be worn from September 1st to October 31st and May 1st to June. T-shirts worn underneath oxford/polo shirts must be plain white with short sleeves or sleeveless. No undergarments with visible writing or designs are to be worn. Sweaters are no to be written on or have drawn designs. Neat, clean, trimmed, and acceptable styled (e.g. above the top of the collar, above the eyebrows, and not extending below the bottom of the ear). The face must be clean-shaven. Only approved Notre Dame T-shirts, shirts, shorts, and sweatshirt and/or pants are authorized for wear in Physical Education classes. Click: “online orders” then, Notre Dame PE Uniforms. Please be sure to read all the information before submitting your order. All orders will be delivered to Notre Dame for distribution to students. There will be no shipping or tax charges. T-shirts will range from $4.00 - $7.00, depending on size. Shorts will range from $7.00 - $9.00, depending on size. ALL STUDENTS (except NJROTC cadets) MUST WEAR A PHYSICAL EDUCATION UNIFORM.